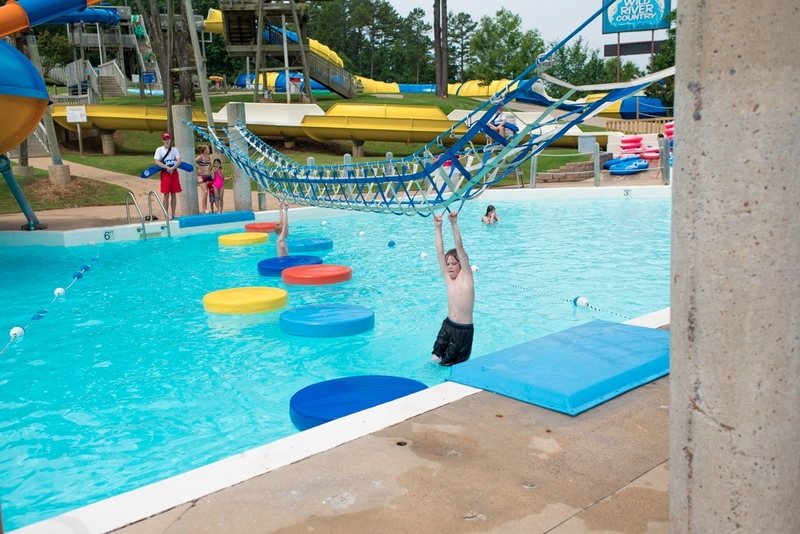 Sure, summers in Arkansas are sweltering, but you're in luck: This state loves its water parks! Here are 10 splashy options to keep you cool when temperatures rise. The free splash pad at War Memorial Park. Sure, summers in Arkansas are sweltering, but you're in luck: The Natural State loves its water parks! There are lots of splashy options to cool down, all just a short drive away. 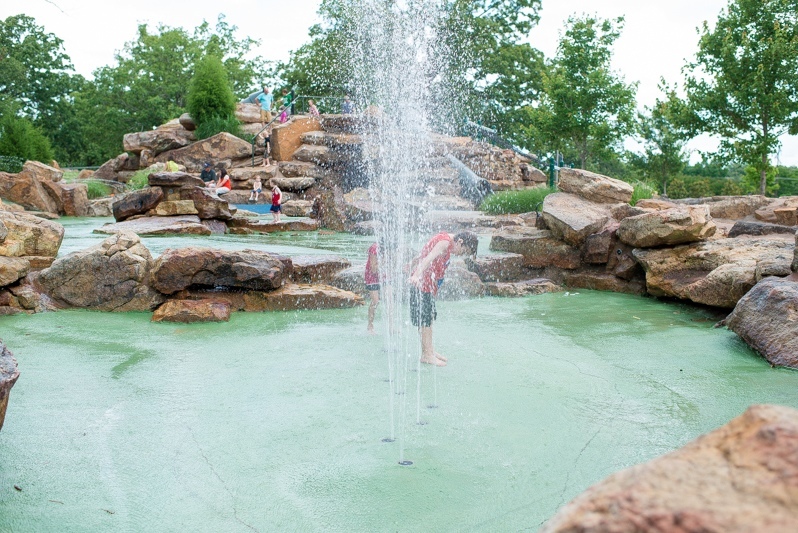 From big-time water parks like Magic Springs to free attractions in city parks, here are 10 water parks and splash pads in central Arkansas. P.S. For summer-born babes, many of the water parks--including Arkadelphia Aquatic Park, Diamond Springs Water Park and Splash Zone in Jacksonville--offer pool rentals and birthday party options. Visit each park's website for more information, or browse our full birthday party guide here. 1. Arkadelphia Aquatic Park: Ask your kids if they’ve ever slid down a frog’s tongue. If the answer is no, be relieved and then take them to Arkadelphia’s Aquatic Park. You’ll find a larger-than-life amphibian to play upon, arching sprays, floating play pieces, a pool with zero depth entry and an open-flume waterslide. Youngsters are guaranteed a hopping good time. Open through Sept. 3; hours vary. Admission $6, 10-visit pass $50, family of four season pass $200. For info: (870) 246-2747, or click here. 2. Crenshaw Springs Water Park in White Hall: This water park in White Hall is named for the natural spring that brought the community's first residents to the area. Visitors will find two 40-foot slides, a lazy river, zero-depth entry pool, a rock climbing wall and splash areas for little ones. Open through Sept. 3: 11 a.m.-7 p.m. Monday-Saturday, 1-6 p.m. Sundays. Adults $12, children ages 4-12 $10, children under 3 free. For info: (870) 247-6964, or click here. 3. Diamond Springs Water Park in Murfreesboro: Even if you don’t find a diamond in the rough at the adjacent Crater of Diamonds, this aquatic playground will keep you in a mining mood. With waterfall hideaways, geysers shooting from beneath the surface, sprayers, waterspouts, cascades, two water slides and more, your little swimmers will dig this place. Open through Sept. 3, 11 a.m.-5 p.m. all summer; check the website for days closed. $10 regular admission, $6 for children less than 42 inches in height, children under age 2 free. Family season pass is $185. For info: (870) 285-3113, CraterOfDiamondsStatePark.com. 4. Magic Springs Water & Theme Park in Hot Springs: Crystal Falls, the Magic Springs water park, includes popular attractions like Splash Island, Boogie Blast, and the Kodiak Adventure River. Younger children will enjoy a few smaller slides, including one shaped like a bowl. Water park open through Sept. 3; theme park is open through Oct. 30. Hours vary throughout the summer. Admission prices vary; season passes available. For info: (501) 624-0100, MagicSprings.com. 5. Splash Pad at Tyndall Park in Benton: Cool off at this community mini water park, complete with water spouts, filling-and-dumping buckets, and a misting arc! Enjoy your lunch at one of the covered picnic tables inside the splash pad area. Open through Sept. 3; 9 a.m.-8 p.m. daily. For info: (501) 776-5970, BentonAR.org. FREE! 6. 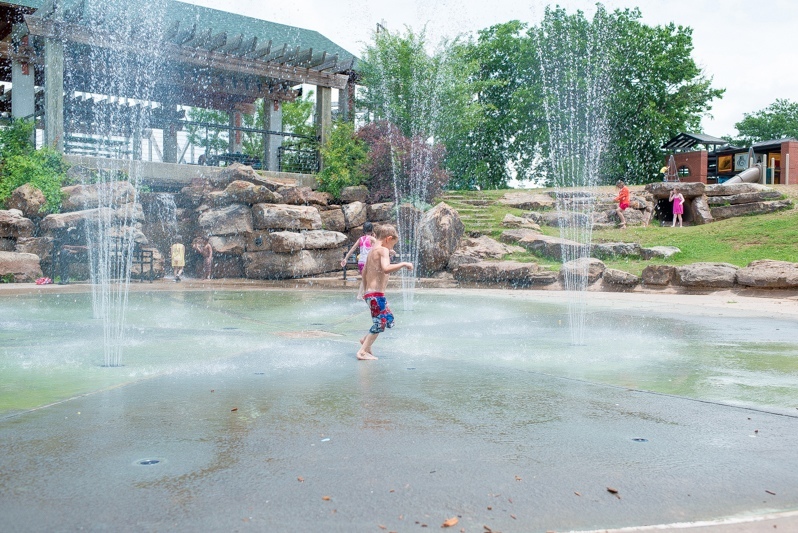 Splash Pads at Riverfront Park: Little Rock Parks & Recreation offers two areas in downtown Little Rock for kiddos to play and stay cool this spring and summer! The first water play area is located in the Peabody Adventure Park near the climbing wall and is open for children of all ages. 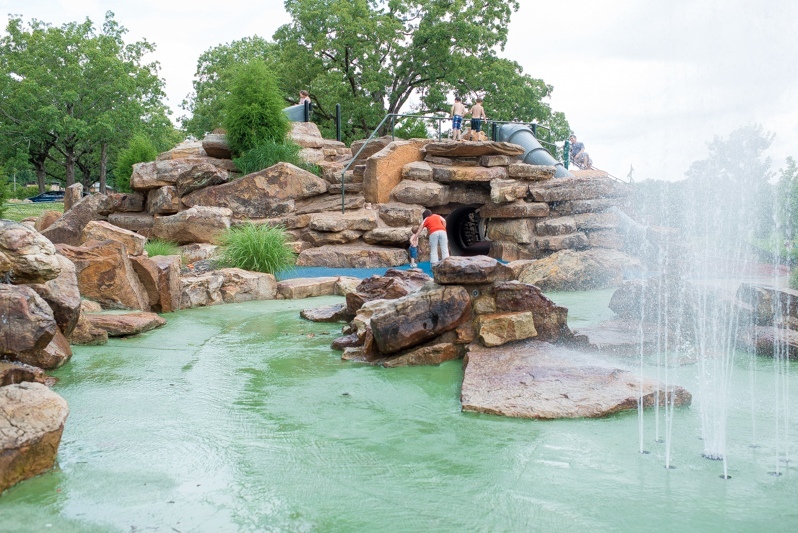 For the little splashers (up to age 5), head to Riverfront Park's Children's Play Area behind the Marriott Hotel and look for the gentle water spouts and beautiful waterfall. Open through the end of September; 8 a.m.-9 p.m. daily. For info: LittleRock.gov. FREE! 7. Splash Pad at War Memorial Park: Open for another summer, War Memorial Park’s splash playground offers rocks, nets, nooks and crannies to climb on with fountains, mist and plenty of water to keep kids wet. A covered slide and a view of Coleman Creek nearby also entice visitors. Open through the end of September; 8 a.m.-9 p.m. daily. For info: LittleRock.gov. FREE! 8. Splash Zone in Jacksonville: This city park in Jacksonville boasts two water slides, a water tunnel, the umbrella-shaped Rain Drop and Dew Drop water showers, and the kids-only Tea Cup. One of the two swimming pools is kid-friendly, with a depth of just 30 inches, perfect for little ones just learning how to use their sea legs. Open through Sept. 3; hours vary throughout summer. $5, children ages 2 and under free; slides $1 extra and not included in passes. For info: (501) 982-7946, CityOfJacksonville.net. 9. 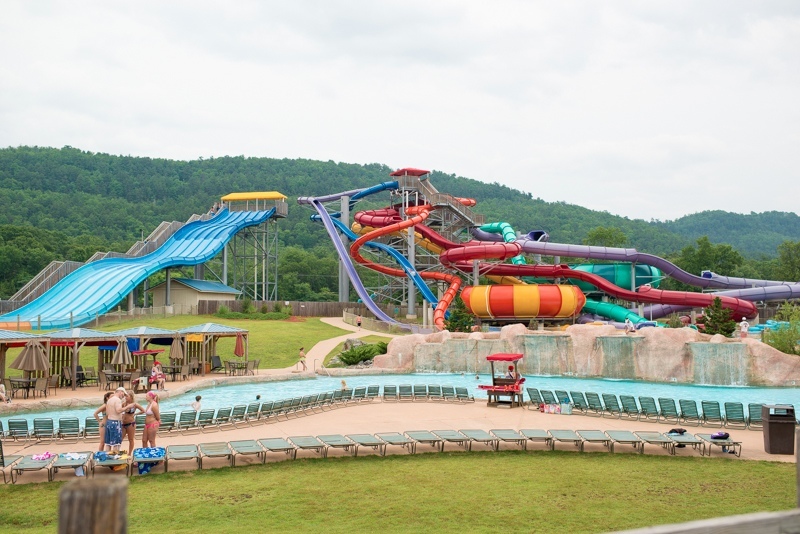 Wild River Country in North Little Rock: Feel the thrill of speeding down the thrilling water slides, including three slides they opened in 2015. Splash in the waves, ride the River Rapids or simply relax as you float around the lazy river. Open through Aug. 26; hours vary throughout the summer. Prices vary. For info: (501) 753-8600, WildRiverCountry.com. 10. Benton River Center: The leisure pool features two lap lanes, a Vortex pool, guest seating area, ADA lift, ADA ramp, and a child's play area that includes an umbrella water fountain, slides and more. This area is anchored by a two-story water slide that will take patrons outside the building before winding the way back inside, making it a perfect place for birthday parties. Open year round. Family memberships are available for $35 a month. For info: BentonAR.org.